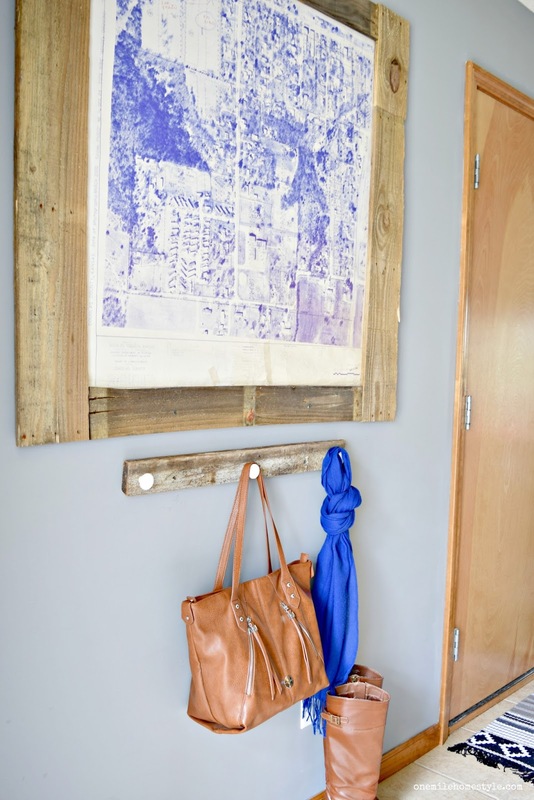 I recently updated the look of our entryway by taking down a small gallery wall, and replacing it with one large statement piece of art, and adding a little extra organization as well. 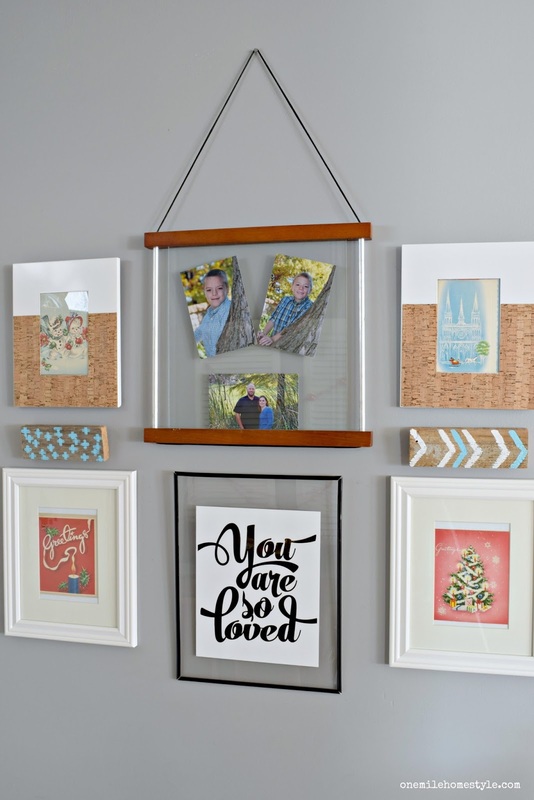 I love a good gallery wall, but I was ready for a change for this space. I recently found a couple of old city maps for the town we live in, and I knew they would be a perfect personalized piece of statement wall art. And they make a huge statement, each map measures 3 feet by 3 feet! 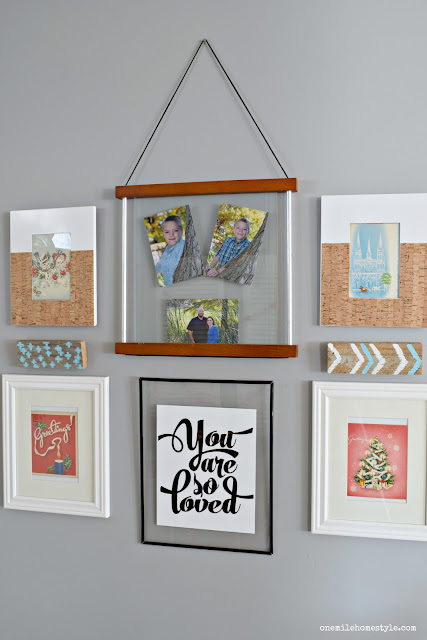 Here is what this space looked like before, and full disclosure, I never took the Christmas cards out of those frames after Christmas. This post may contain affiliate links for your convenience, you can see my full disclosure here. I wanted a rustic look for the frame around this map, so I grabbed a few wel-weathered pieces of wood from my pallet wood supply. For the back of this wall art, I used a 1/4" sheet of Masonite that was cut slightly bigger than the map itself. Since this statement art is so big and heavy, I just screwed it directly into the wall studs at the top and bottom, instead of messing with adding hanging hardware. 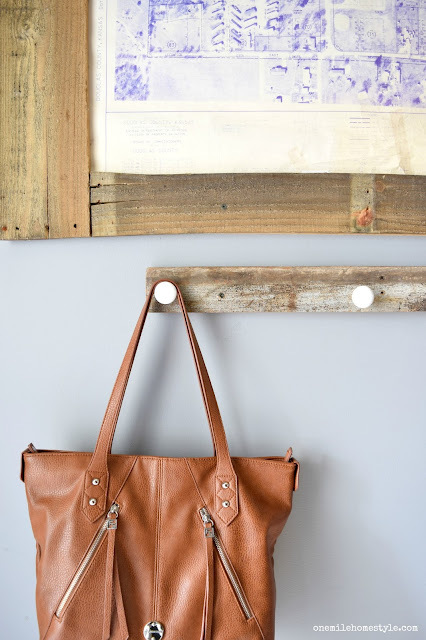 To finish off the new entryway look, I added a DIY hanging organizer from a piece of barn wood and white ceramic knobs. Switching up a small gallery wall for one large piece of statement art has given our entryway a fresh new look. And a map of our town is a fun way to add a little personalized art to our home. 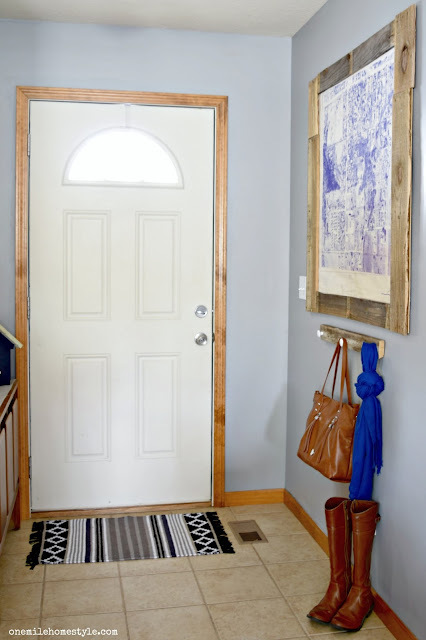 The entryway already feels more welcoming, and the single large statement piece of art makes the space feel less cluttered, but makes a simple bold statement. Tell me in the comments, do you use maps as decor in your home? Love love love this so much! I have a couple gallery walls that I'm leaning toward replacing. I'm just a little "over" them. You guys are so handy! Great job. What a beautiful way to display the maps! I have some work to do to personalize our entryway! :) Thanks for the inspiration. Thanks! I feel like this part of the house has been neglected for awhile!! I really love your entry way updates. Thanks for sharing. 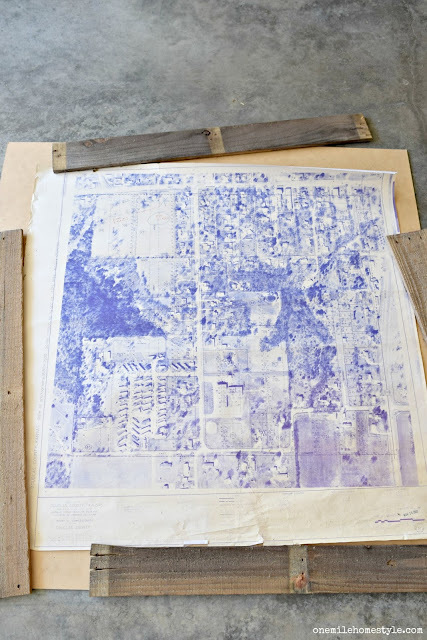 I love old maps! You did a fabulous job with the maps and the entry way. Thanks for sharing and entering at our Under $10 reader challenge. Good Luck! Thanks Gail! Old maps are so fun to decorate with! 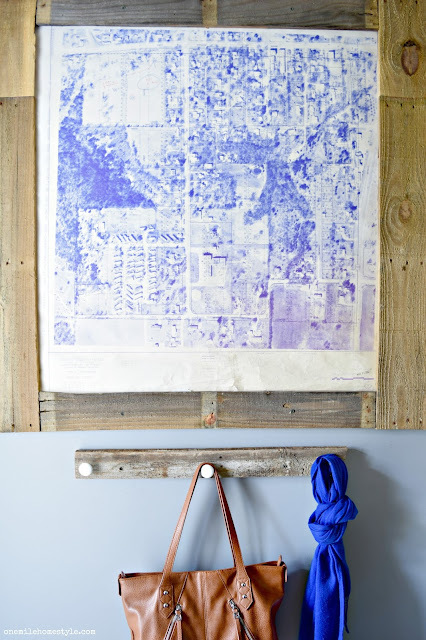 What a great way to showcase an old map - love this idea! 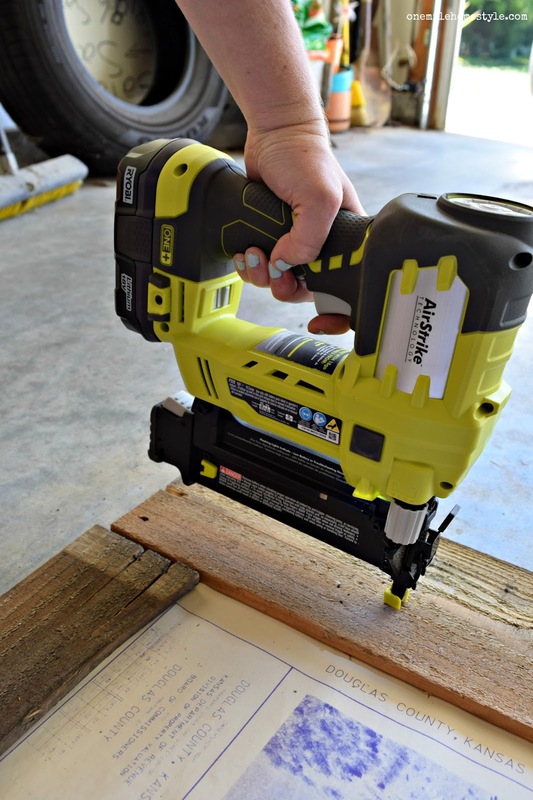 Thanks for linking up to our Power Tool Reader Challenge. Copyright 2013-2018 One Mile Home Style. Hi! 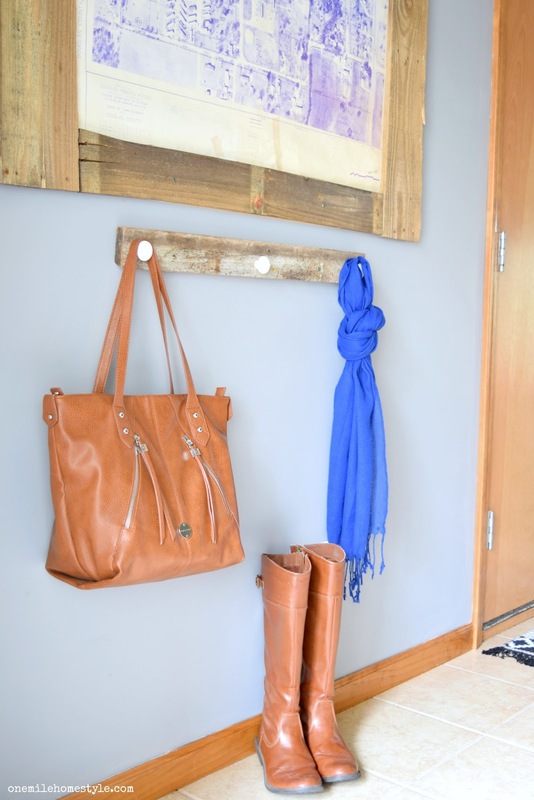 Welcome to the One Mile Home & Style blog! I'm Stephanie, and I'm so glad you are here! I am a small town Kansas girl, a mom to 2 amazing, baseball-obsessed boys and a wife to my high school sweetheart. I love home decorating, organizing, and attempting to be trendy. Come join in on the fun! Visit Steph Confer's profile on Pinterest. Thank you for visiting One Mile Home Style, it is my hope that you enjoyed what you saw here and found inspiration for your own home. You are more than welcome to share a single photo, but you must provide credit to One Mile Home Style and link back to the original post. Some of my blog posts may contain affiliate links. This means if you click on a product link and purchase a product, I may earn a commission; it doesn't cost you any more, and it provides One Mile Home Style with financial support. Rest assured, I will only link to products I myself have bought, or would buy. Thanks for stopping by, come back again soon!